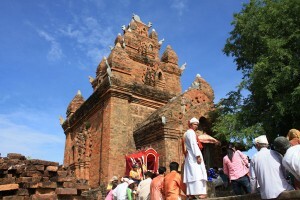 The second day (main festival day) is for Kate Festival at Po Inu Nagar Temple, Po Klong Garai Tower and Po Rome Tower. The festival takes place in three areas at the same time. In the early morning, the Ra Glai people in Phuoc Dong Hamlet, Phuoc Hau Commune, Ninh Phuoc District arrive at Po Klong Garai Tower in Do Vinh Ward, Phan Rang – Thap Cham City to hand King Po Klong Garai’s costume over to the Cham people. When the procession arrives at the tower, a group of dancers will perform a welcome dance in front of the tower. After that, the ritual to ask permission of God Siva to open tower’s door is held. The offerings include wine, egg, betel and areca, water mixed with aloe wood. The following rituals are bath and wear for the statue of King Po Klong Garai. Finally, a man (Kadhar) sings hymns to invite over 20 gods to attend great ritual. At the same time, participants pray the gods for health, happiness, abundant crop… The great ritual ends with a dance of ba bong (Muk Payâu).